We said goodnight to a hero yesterday, strong magnificent Max who lived for nearly fourteen months past his bone cancer diagnosis. His stunning blue eyes, his enthusiasm and his stoic pawsonality put smiles on the faces of everyone he met. Max will never, ever be forgotten. In the spirit of our courageous hero, we want to share these fun clips of him with you. 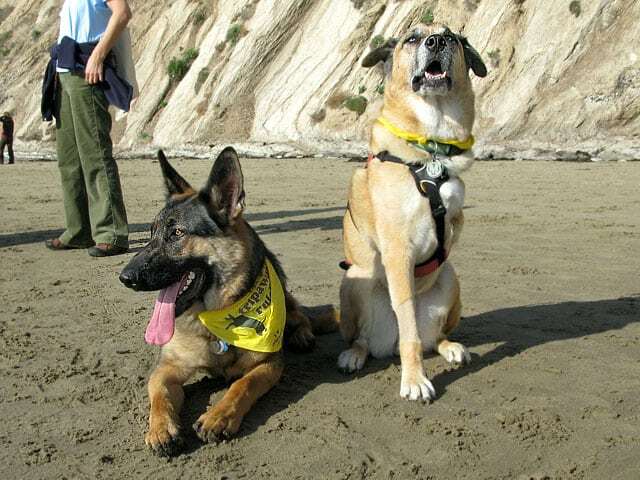 This movie was taken at our Tripawds get together in Santa Barbara last December. You can see here that not even lung mets could stop this boy from having a good time with the other pups. Here’s a flashback video starring Max, taken when we met him in February 2008, not long after his amputation and diagnosis. And here’s a few photos of Max will always put smiles on our faces. Run free Max, go get ’em! That was a great tribute to Max! What a great fight he gave…happy memories of Max..
Rest in peace, sweet Maximutt. Your spirit will live on in all of us tripawds. You are loved. Max was a beautiful boy. We’ll burn a candle for him tonight. Rachel, Major, Dusty, and Balou. What a beautiful tribute to Max!!! But we have all these beautiful memories that will live on… and that’s what I try to concentrate on… though its so much easier said than done. Marguerite, thank you for sharing your love and support to our pawrents, especially when they are coping with grief. Your kindness is so much appreciated.